Contemporary shower room in London with flat-panel cabinets, medium wood cabinets, beige tiles, multi-coloured walls, an integrated sink and beige floors. Design ideas for a classic bathroom in London with black and white tiles, metro tiles, a console sink, grey floors and an alcove shower. Contemporary ensuite bathroom in London with a built-in sink, flat-panel cabinets, grey cabinets, grey walls and a hinged door. Dimensions: D 690 x W 1700 x H 1160mm. The Crake features a sturdy and practical stand with a chunky storage shelf perfect for keeping spare towels, or other accessories. Suitable for basin taps or basin mixer taps. A special type of seduction The La Belle Collection transports us back in time to the Romantic era, thanks to its timeless sensuousness. The collection's elegantly curved lines and sensuous details, such as the La Rose floral decor are truly seductive. The functional aesthetics in La Belle can be seen in the ceramic waste cover in the wash basin. Small contemporary bathroom in London with a built-in sink, an alcove bath, a shower/bath combination, beige tiles, ceramic tiles, beige walls, ceramic flooring and beige floors. 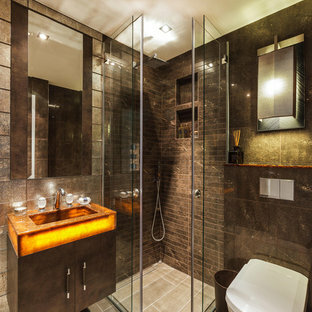 Photo of a contemporary bathroom in London with an integrated sink, flat-panel cabinets, a corner shower, a one-piece toilet and brown tiles. Inspired by the sea, our new Pescadero bath features a unique “wave” shaped rim. With its deep and double-ended bathing well, the Pescadero is the perfect bath for one or two people. 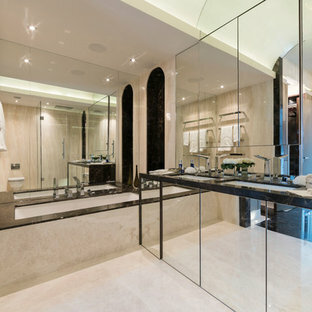 Large contemporary ensuite bathroom in London with a walk-in shower, a wall mounted toilet, beige tiles, beige walls, marble flooring, a built-in sink, marble worktops and a submerged bath. 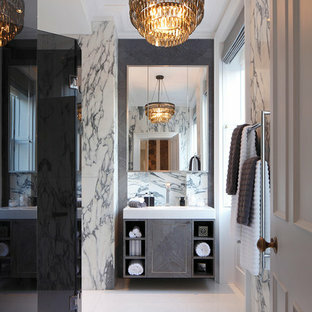 This is an example of a classic bathroom in London with blue cabinets, white walls, mosaic tile flooring, a submerged sink, marble worktops and grey floors. 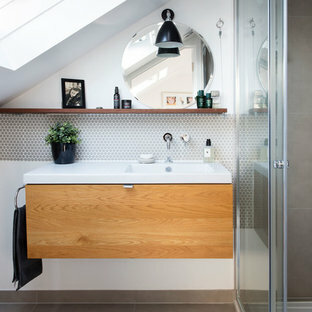 Small contemporary ensuite bathroom in London with open cabinets, medium wood cabinets, a built-in bath, a wall mounted toilet, white walls, slate flooring, wooden worktops and a vessel sink. Photo of a small classic family bathroom in London with grey tiles, wooden worktops and a hinged door. 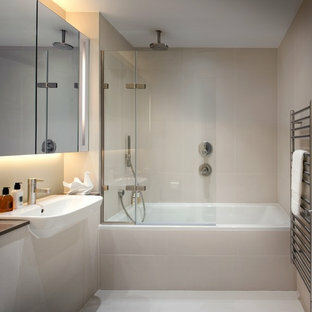 Photo of a contemporary bathroom in London with flat-panel cabinets, grey cabinets, an alcove bath, a shower/bath combination, grey tiles, grey walls, a submerged sink and a hinged door. 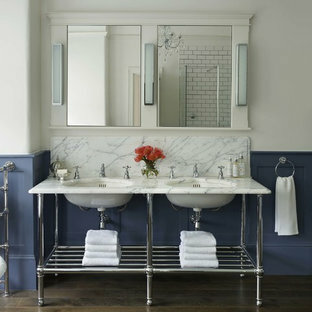 Design ideas for a classic bathroom in London with grey tiles, ceramic tiles and a wall-mounted sink. 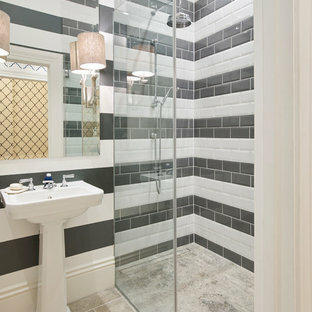 Traditional bathroom in London with grey cabinets, an alcove bath, a shower/bath combination, a built-in sink and an open shower. Photo of a medium sized contemporary family bathroom in London with shaker cabinets, grey cabinets, a built-in bath, a shower/bath combination, white tiles, ceramic tiles, ceramic flooring, a wall-mounted sink, solid surface worktops, grey floors, an open shower, a one-piece toilet and white walls.